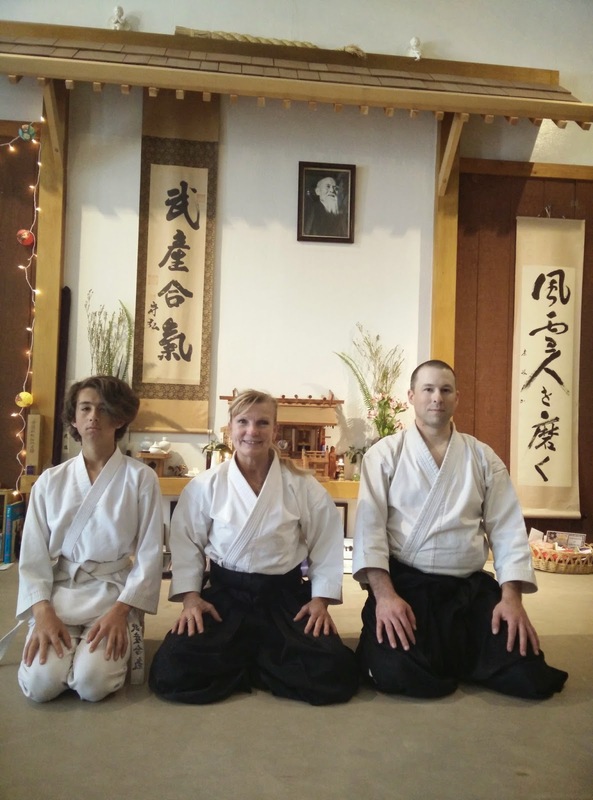 Evan and I are back from a week at Aikido of San Leandro and training with Pat Hendricks Shihan. Evan did a successful 4th kyu test during the teens class on Friday so congratulations! Being the only uchideshi has its advantages. Sensei spent all week focusing on the 4th kyu requirements for Evan, and san-dan requirements for me. I am feeling more confident about my upcoming test in August. I brought back a lot of updates so come on out and get the latest! Since we're still transitioning from another style, the updates will be a constant fact of life for a few years. Not that what we're doing is wrong, but sometimes it is not the current variation of a technique or pin. These are important to keep up to date for when people who train at Kinjo go out to practice and/or test in San Leandro. Also last week we worked on the 10 kumi-jo and variations. Coincidentally, that is what we're doing at Kinjo this week! Open hand attack will be moro-te-dori.